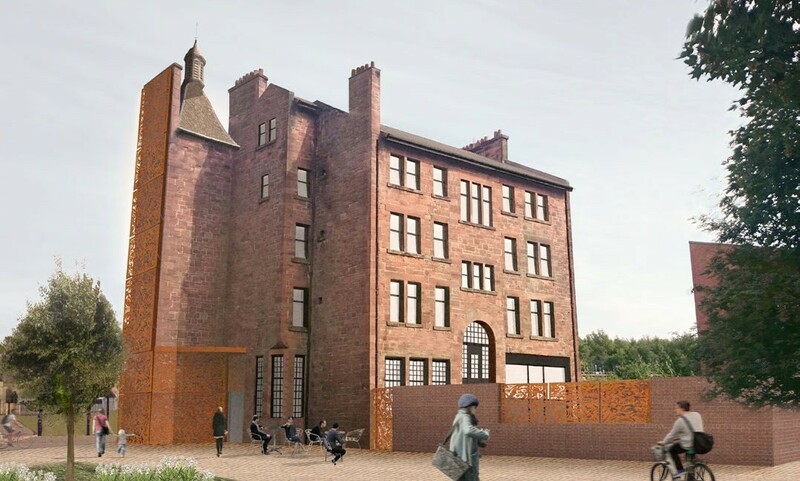 Page\Park Architects are bidding to bring a forgotten survivor of the Gorbals’ tenement past back to life with a full rehabilitation of the A listed former British Linen Bank on behalf of Southside Housing Association. 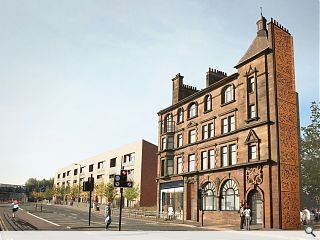 The at risk landmark is one of a handful of listed buildings to survive in the area, making it a priority for refurbishment to arrest further deterioration of the structure following completion of the adjacent Laurieston regeneration scheme. Under the plans ironmongery and other period features will be restored where possible together with the creation of a number of elements originally conceived by architect James Salmon but which went unrealised in the finished design. This includes installation of a roof turret and recreation of metal balustrading to the third floor balcony as well as a reworked gable elevation through a sculptural artwork to enliven a planned linear park. A courtyard wall would also be opened up with metal screens to provide access and views to a backcourt area. Surely the original intent of these buildings was to be part of a street terrace and not stand in splendid isolation. Very disappointing that the new build did not respect the street line. 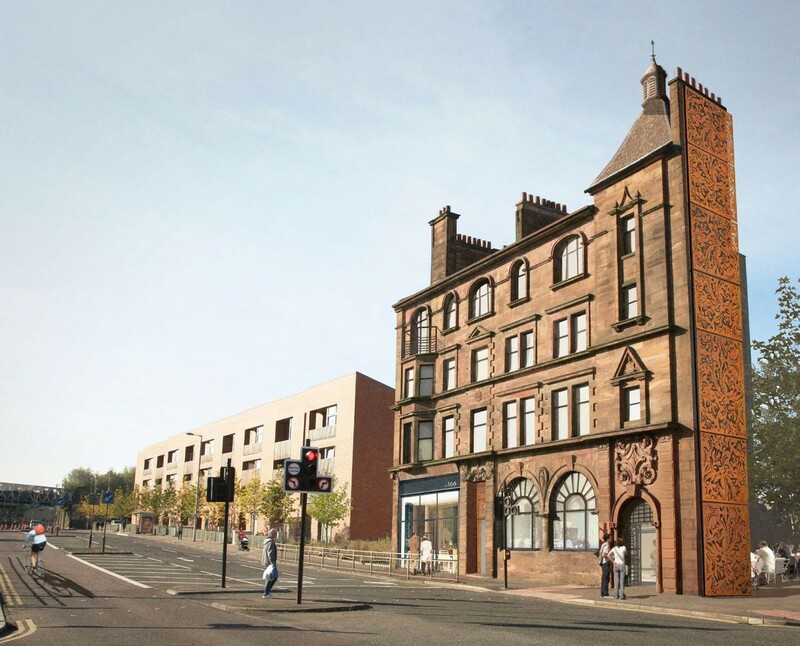 Great news for this beautiful building, well done Southside HA and Page/Park for moving a step forward with this complicated, but important project. I have to agree with the other two gentleman the building will stick out look totally out of place not in line with the regeneration in the area or the new builds and I stay in Margaret street I know the building looks terrible just now but if it means saving it I'd rather they knocked it down and rebuilt rather than have it sticking out like a sore thumb. Great news indeed for this beautiful building. I admire every it every day , as i commute to work and often wander , what will become of it. Good luck Page/Park and Southside Ha. They should knock it down. Better that there be no vestige at all of the great stone city built with care and craftsmanship and artistry and pride. At last good news. I have admired this building for years. Exciting times with the citzs getting a makeover too.The Church needs to be next. The whole area has changed for the better. The only disappointment is the lack of a Gorbals cross ...a focal point for the area like Bridgeton cross umbrella. Maybe too close to city centre to have a retail development around the cross. Not obvious that there was once a vibrant cross here in years gone by before the relocation of most of the Gorbals 250 000 residents to the new towns and housing schemes. Just wish they could have saved more buildings from the madness of city planning in the 60s. Another great stride towards redeveloping this area. I like this despite the negative comments conveyed here. Great news. Glad they kept it as a memorial to the old Gorbals. But gets me thinking, just how did this building manage to survive? Everything around it was knocked down, but why did they spare this? I think it's great to see this building being saved but looking at the proposals I can't help thinking it needs a better frontage to the new public space - something more than a garden wall. Another great milestone in the physical regeneration of the shattered streetscape of the Gorbals and Laurieston. It's just a great pity that the magnificent Coliseum Theatre by Matcham was recently lost. I agree that the Caledonia Road Church is the next big priority and also consideration needs to be given to a faithful restoration of the scale and massing of the original 1870s Gorbals Cross by the City Improvement Trust, which was a Parisian-esque streetscape and a striking gateway to the southside. 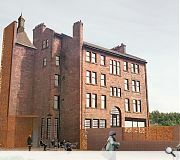 Glasgow should wholly adopt the Berlin model of 'critical reconstruction' in its approach to rehabilitating the former Comprehensive Development Areas like Gorbals. #1...I think if you followed the street line you'd be right onto the road and with the previous squint tower blocks being farther back from the street line that would have had the street feeling very narrow?? Great that this is being given purpose and attention. Why waste it? No need for the frilly corten cladding - the old building is much better than its new dress. It really highlights the generic, bricky blandness of the newest Gorbals work by P/P and E&C. I have waited a long time to see this tennement, brought back to life. Well done everyone involved and no doubt the refurbishment will be done to the exacting standards of Southside HA. Ignore the critics, they have no idea how hard it is to get anything done, let alone this complicated little building! Can't believe the number of people(presumably Architects) commenting on demolition of this splendid building. Surely we should be congratulating the HA and Page & Park for coming up with a scheme and the funds to retain a heritage that we should be proud of. Too many of these fantastic buildings have been destroyed through narrow mindedness and a lack of foresight. Lets see how long it will be before we are demolishing or refurbishing the bland modern carbuncle beside it. Having to agree with some. Needs to come down. Looks wrong in its context. Can't imagine this changing. Demolishing would also allow proper road alignment. Would architects please turn their attention to Tradestoun instead. @20. "Looks wrong" is subjective and therefore overruled. The P/P stuff next door looks more wrong to me. Not sure what you mean by "proper road alignment"? Is Venice a less successful urban environment than the Gorbals because of its bendier streets? A final thing: architects "turn their attention" to whatever is offered to them by the people with the money.